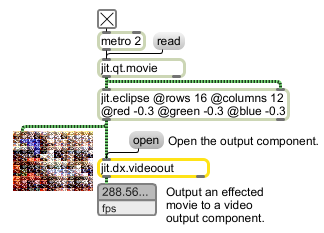 The jit.dx.videoout object takes a matrix as input, compresses the data and sends it directly over FireWire to an attached DV camera. MACINTOSH USERS: The jit.dx.videoout object uses DirectX, and is Windows-only. Please refer to the jit.qt.videoout object. open Opens a connection to a FireWire device for video output. You must open the connection before the jit.dx.videoout object does anything. close Closes the connection to an open FireWire device. The connection is automatically closed when the object is freed.